This past Saturday we had our second nine hour class session. We were absolutely dreading it.. The first session was so rough, but this one ended up not being so bad. People seemed to calm down on the stories they were sharing, which we appreciated greatly. 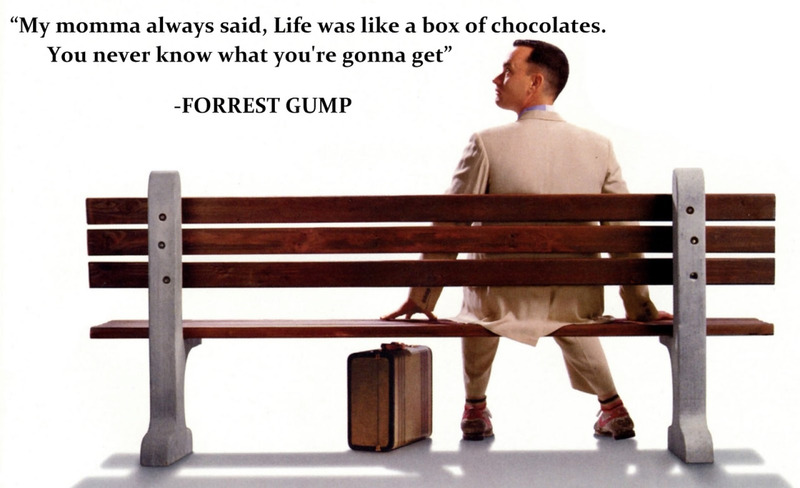 One of the things that stood out to me was a quote our teacher said from the movie Forrest Gump. “Life’s like a box of chocolates, you never know what you are going to get.” When I was a kid, my grandma (Nin) and I used to split boxes of Russell Stover’s chocolate. These used to come with a map on the inside of the box that would tell you which chocolates were where. The corners were always vanilla, nasty coconut was in the middle, and so on. For fun every now and then, we would switch the pieces on each other just to see the surprised look on each others face when you take a bite expecting orange, but it was actually lemon. Each piece was a new adventure, but it was always worth it in the end. Now take this quote and look at it in terms of adoption, crazy how much it relates right? When adopting through DHS Foster Care we will get to look at a child’s history folder before we even meet them. This allows us to prepare for any disabilities or conditions they may have. It also allows us to see their history, which in turn will give us a view of their mannerisms and attitude towards life as a whole. I have talked to countless people who have adopted through OKDHS and they have all said the same thing: It is nice to be able to read their file and get a small idea of what has happened to these kids. However, there is always a LARGE chance that un-surfaced emotions, feelings, and conditions that will arise once they move in with you and sometimes these things will not surface until the adoption process has been finalized and these kids begin to feel truly safe in your home. So with that said, I think that quote fits perfectly in the adoption world. God is going to bless us with a box of chocolates. With each new bite (day) it will be a new adventure. This session, sessions 3, 4, and 5, based a lot on how to deal with traumatized children, discipline versus punishment, and other related topics. We learned a lot about ways that we can and cannot discipline our children due to them still being under State care. I think things will get interesting if all of our nieces and nephews are playing together with our children and then we have to discipline our children differently then the others. But, its a challenge that I can now say we are prepared for. We also learned a lot about children’s impressions of themselves. The below picture is a page in our book from a book/movie that we all know very well…. except apparently our instructors. While she read the quote she kept saying “Seeerus” rather then “Sirius”. Josh and I just kept looking at each other and giggling through this whole section. 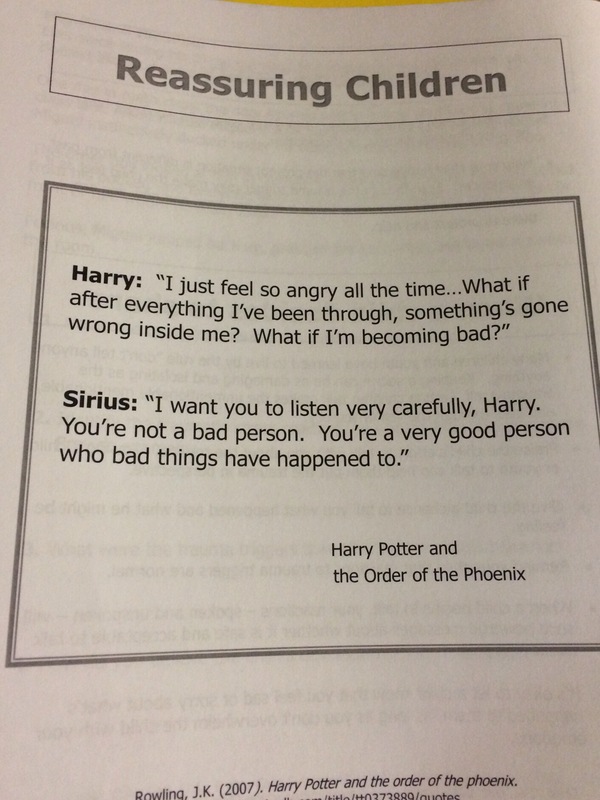 Regardless, the quote was a good representation of how children that have been through trauma perceive themselves. One last exciting thing! We had part three of our home study on Tuesday July 21st. Which coincidently is also the day Josh and I got engaged 5 years ago, ironic right? Part 3 consisted of us reading the report our contractor wrote about our lives. Can I just say how weird it is reading a 17 page paper about you and your husbands lives since birth? Awkward, Strange, Intrusive, Depressing, Eye Opening…. all words I would use to describe this process. But, we signed off on it after some minor corrections and that’s it! The home study section is done. Our contractor from North Care will now give our file to her supervisor. Assuming the supervisor approves it, she/he will then send it back to our Introductory Case worker at DHS. Then is she approves it and we complete our last 9 hour class this weekend…. We will be approved! Our home study case worker said we should have nothing to worry about, she has seen worse get approved ha ha!! So now its just a waiting game for that phone call! Sorry for the novel. Not much is happening in our adoption adventure right now. But when things do happen, they seem to all happen at once! Kayla, you have such a great outlook! You honestly have the perfect attitude. Adoption can be very hard for those expecting the perfect baby. You never know what they will be like but you already know you will love them! good job! The more I read, the more excited I get for you! !